The cruise control is becoming more and more popular in PPG. This system enables the pilot to set the desired power and maintain it without the need to squeeze the throttle. There are many kinds of cruise control. 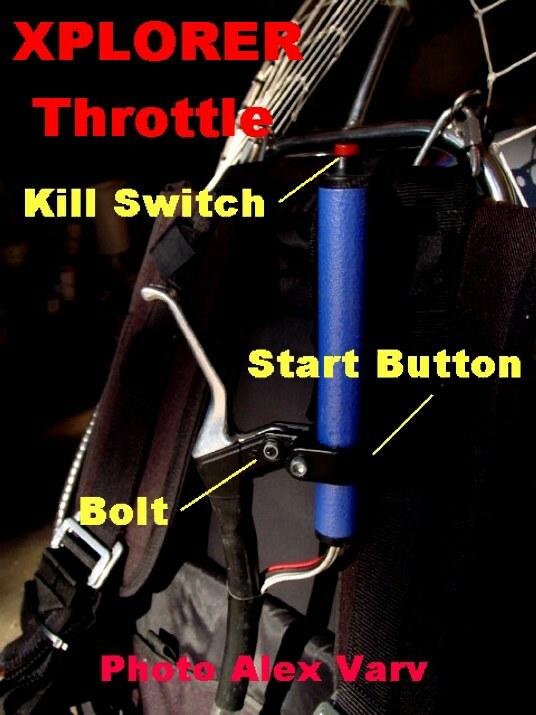 The most popular one is the "friction system"
I used this system on a Fly Power 115/3 paramotor. Note: the cruise control should be activated when flying in smooth conditions only. Deactivating this mode requires some time and if flying in turbulent conditions, the pilot can be exposed to many potentially dangerous situations! 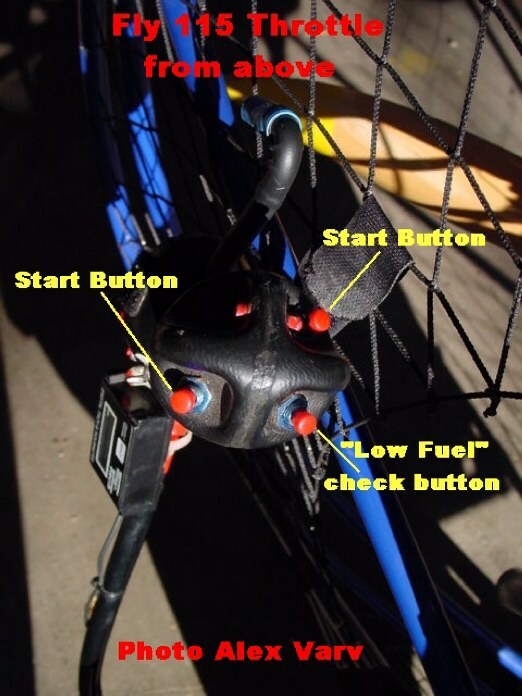 Hold the throttle at the desired RPM and tighten the butterfly nut. 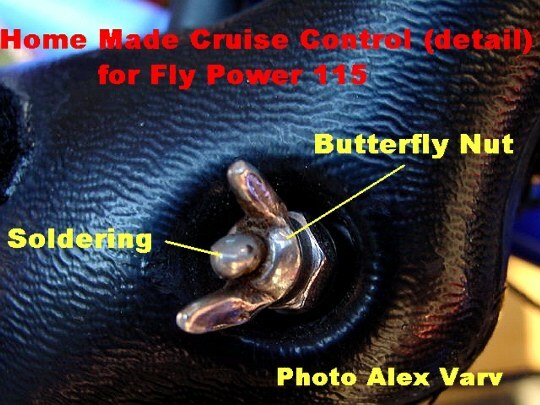 Hold the throttle firmly and unscrew the butterfly nut. If the throttle is not firmly held, while deactivating the control, there may be a sudden return to idle RPM, putting the pilot in a potential dangerous situation! The main disadvantage of this system is that the pilot needs a few seconds to activate or deactivate it. In my opinion, the best Cruise Control ever made is the one used on the DK Paramotors. It can be set instantly with one hand. I have used this mode for a few years and I got used to it. It is very safe if properly operated and if the pilots flies with it in smooth conditions.The Throttle can be hung to the side of the harness and the pilot has free hand and can comfortably take pictures, read a map or just relax. Before describing how this mode works, we will present a model already installed by the factory. 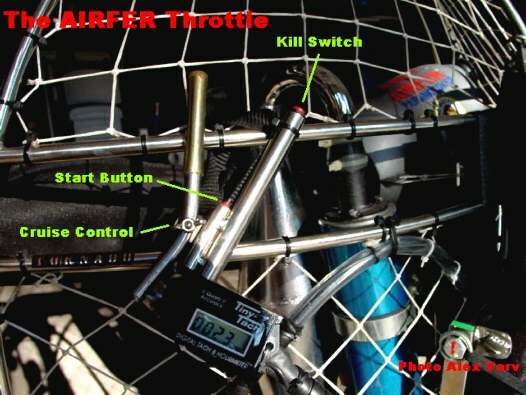 It will be the AIRFER Tornado throttle. 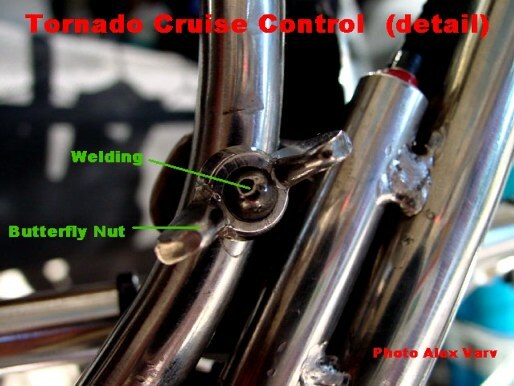 The Cruise Control I built is very simple and uses the same principle shown on the Tornado. Since the plastic cover came apart, I installed two plastic washers on each side of the throttle handle inside the cover. 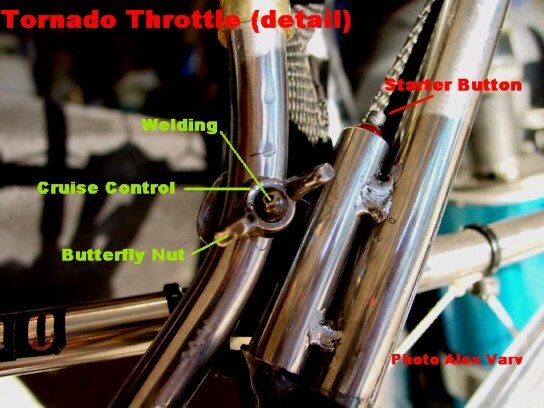 The original throttle bolt was replaced with a longer one and fitted with a butterfly nut. Please look at the picture below. Two additional metal washers were used on the outside. One under the bolt head and one under the butterfly nut. The two plastic interior washers were installed to increase the friction needed to hold the throttle setting. The plastic throttle cover was glued back using a hot and clean soldering iron. Note: It is really not necessary to open the throttle covers and installing the plastic washers. The soldering shown above was performed for safety reasons. 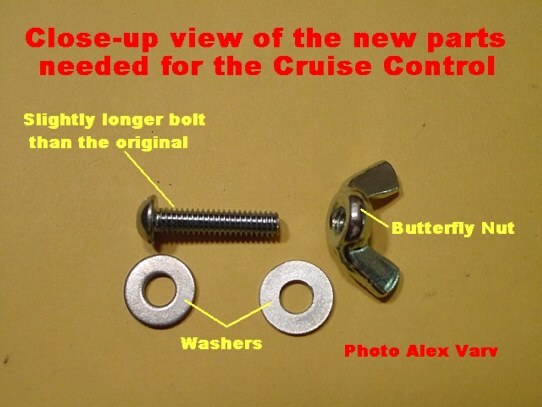 It will prevent the butterfly nut from falling off while the "cruise control" is not in use. I would like to emphasize that this system can be mounted on any throttle. 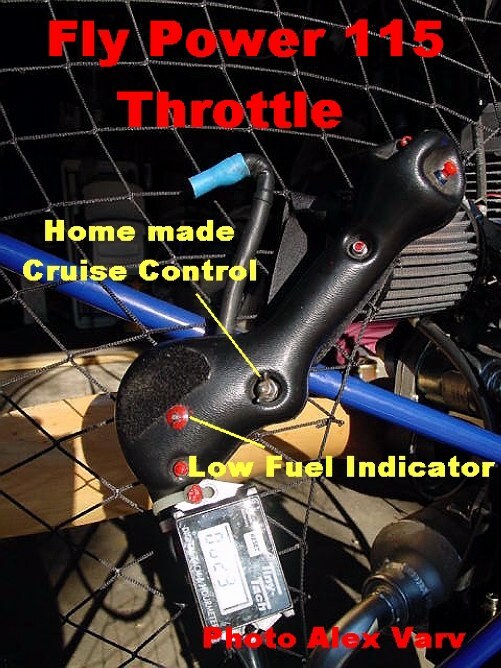 Below is a picture of an XPLORER throttle. All we need to do is to replace the original bolt (shown in the above pictures and below) with a longer one, equipped with a butterfly nut.